"Peppermint margarita with a candy cane rim." Pour 1/4 to 1/2 inch of red sugar onto a small, shallow plate. Pour 1/4 to 1/2 inch of white sugar onto another small, shallow plate. Moisten the rims of margarita glasses with a wedge of lime, dip the moistened glasses into the red sugar, then the white, alternating sugars so that the edge of the glass looks like stripes on a candy cane; set aside. Blend tequila, simple syrup, limeade, peppermint schnapps, triple sec, and lemon juice in a blender until smooth. Pour tequila mixture into a quart jar. Fill blender with ice cubes. Pour 1/4 the tequila mixture over the ice and blend until smooth. Add grenadine for color while the mixture is blending. 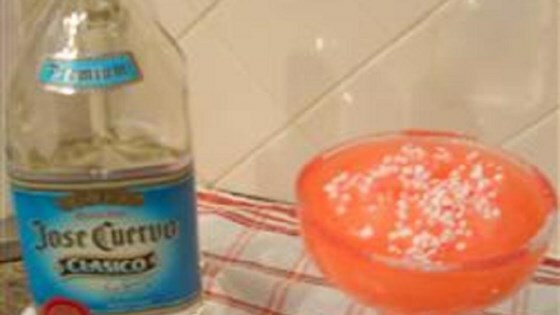 Pour mixture into prepared margarita glasses, add a splash of orange liqueur, and sprinkle crush candy canes over each margarita. Repeat with remaining tequila mixture and ice cubes. Learn how to master the margarita from Chef John.